Cover image: Head of Justice (1991) Concrete, 11” x 8.8” x 9” Martin Luther King Jr. Federal Courthouse, Newark, NJ Artwork and Photograph reproduced with permission of the artist © Diana K. Moore _______________________________________________________ Constant changes in administrative law and shifting political winds reinforce the need for an up-to-date volume that critically examines the law in its contemporary, as well as historical, context. This fourth edition assesses the amalgamation of the federal administrative tribunals, the abandonment of plans to abolish the Australian Information Commissioner, the revamping of the rules regarding federal delegated legislation and the controversies around the rules of standing to challenge government environmental decisions. It also reviews a string of possibly far-reaching High Court rulings, such as Minister for Immigration and Citizenship v Li (unreasonableness revamped), Plaintiff M-64-2015 v Minister for Immigration and Border Protection (government “priorities” ruled relevant), Maritime Union of Australia v Minister for Immigration and Border Protection (limits on the use of ministerial determinations), Wei v Minister for Immigration and Border Protection (jurisdictional error and the mandatory/directory distinction), Minister for Immigration and Border Protection v WZARH (procedural fairness and “legitimate expectations”) and Isbester v Knox City Council (bias and the Stollery principle). These developments highlight the ever-evolving shape of administrative law. 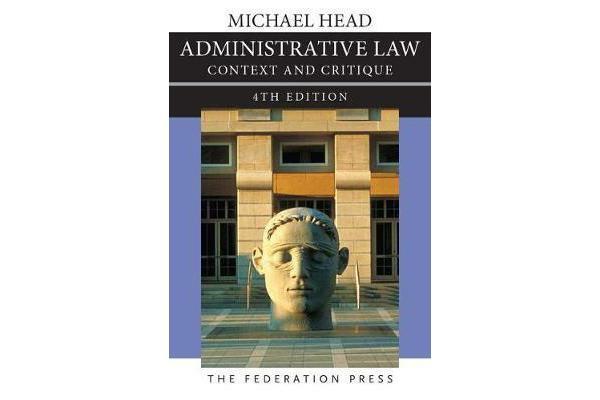 They underscore a central argument of this book – the necessity to examine the content and trajectory of administrative law in its political, administrative and socio-economic settings. This edition is further fashioned from the author’s experience of teaching administrative law since 1998.